Ayub Khoso is a Pakistani actor with a Balochi ethnicity. He started acting while in school, and did his first TV drama with PTV. He has appeared in various different Pakistani dramas that were broadcasted from the Quetta Centre of PTV. He currently works for Sindhi channels such as KTN and Sindh TV. Ayub is fluent in Brahui, Sindhi, Balochi as well as Urdu. He has also been nominated for best actor by PTV as well as KTN. Ayub is also involved in politics as well, and is a sound supporter of the Pakistan People's Party from Jacobabad, Sindh. He has also acted in Khuda Kay Liye, a famous movie by Shoaib Mansoor. 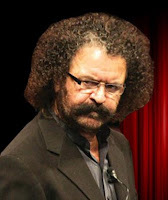 Apart from Urdu dramas, he has also done a great number of Balochi dramas as well, all of which were aired from the Quetta Centre of Pakistan Television. Currently, he is working on several projects, but his association with the Pakistan Peoples Party has often come under criticism.